Magalh�es, T., Mossolin, E. C. & Mantelatto, F. L. Gonadosomatic and Hepatosomatic indexes of the freshwater shrimp Macrobrachium olfersii (Decapoda, Palaemonidae) from S�o Sebasti�o Island, Southeastern Brazil. Pan-American Journal of Aquatic Sciences, 7(1): 1-9. Download PDF file (320 Kb). Nogueira, M. M., Souza, C. S. & Mafalda Jr., P. The influence of abiotic and biotic factors on the composition of Tetraodontiforms larvae (Teleostei) along the Brazilian Northeast Exclusive Economic Zone (1�N - 14�S). 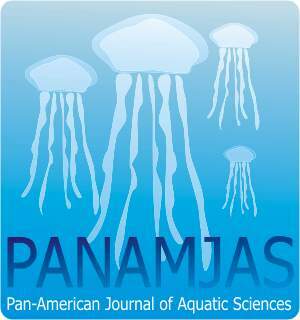 Pan-American Journal of Aquatic Sciences, 7(1): 10-20. Download PDF file (352 Kb). Mendon�a, S. A., Macena, B. C. L., Creio, E., Viana, D. L. & Hazin, F. H. Record of a pregnant Mobula thurstoni and occurrence of Manta birostris (Myliobatiformes: Mobulidae) in the vicinity of Saint Peter and Saint Paul Archipelago (Equatorial Atlantic). Pan-American Journal of Aquatic Sciences, 7(1): 21-26. Download PDF file (406 Kb). Izidoro, F. B. & Le Pendu, Y. Estuarine dolphins (Sotalia guianensis, Cetacea, Delphinidae) play at Porto de Ilh�us harbor, Bahia, Brazil. Pan-American Journal of Aquatic Sciences, 7(1): 27-36. Download PDF file (353 Kb). Ferreira, L. C. & Vooren, C. M. Pan-American Journal of Aquatic Sciences (2012), 7(1):37-44 Diet of the lesser electric ray Narcine brasiliensis (Olfers, 1831) (Elasmobranchii, Narcinidae) in southern Brazil. Pan-American Journal of Aquatic Sciences, 7(1): 37-44. Download PDF file (244 Kb). Batista, H. O. B., Camargo, G. M. B., Oliveira, P. G. V., V�ras, D. P., Pinheiro, P. B., Fernandes, C. A. F., Travassos, P. & Hazin, F. H. Occurrence of the hybrid snapper between yellowtail snapper Ocyurus chrysurus (Bloch 1791) and lane snapper Lutjanus synagris (Linnaeus 1758) (Perciformes: Lutjanidae) in the Southwest Atlantic, Northeast Brazil. Pan-American Journal of Aquatic Sciences, 7(1): 45-49. Download PDF file (467 Kb). Lopez K., S., Barr�a M., P. & Mel�ndez C., R. Feeding and trophic relationships of two highly migratory sharks in the eastern south Pacific Ocean. Pan-American Journal of Aquatic Sciences, 7(1): 50-56. Download PDF file (434 Kb).